Promicron is a highly innovative system- integrating company providing advanced microscope-based solutions in optical metrology, inspection and review. Promicron equipment is engineered to meet your demands for production and research of IC`s , MEMS, solar cells and any kind of large and flat substrates. We customize our tools to your needs, based on our modular MCS Software and a range of well established optical subsystems from Leica and other leading suppliers. 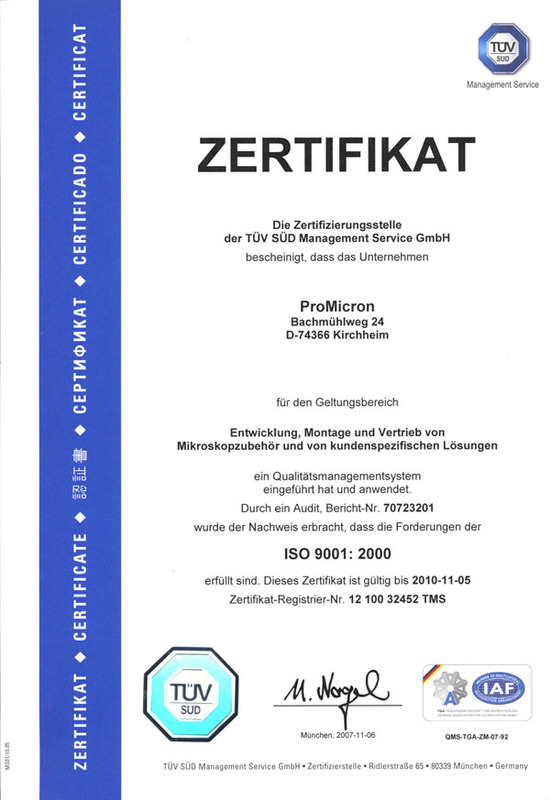 Promicron ist eine hoch innovative, systemintegrative Firma, die manuelle und automatische Systeme für optische Inspektion, Review and Metrology anbietet. Promicron entwickelt Systemlösungen und Software, die auf Ihre Anforderungen in Produktion und Forschung abgestimmt sind, z.B für die Produktion von IC's, MEMS, Solarzellen und verschiedensten großen und flachen Substraten. Basierend auf unserer modularen Software und einer Reihe von gut etablierten optischen Subsystemen von Leica und anderen führenden Lieferanten bieten wir Systemlösungen, die sich exakt an Ihren Wünschen orientieren. Leica Microsystems: microscopes, microscope cameras and components. As your engineering partner, we can offer you our experience in electronics, design engineering and optics to adapt automated and manual systems to your requirements or to carry out new developments. or call us in our office!